In Michigan, we have two varieties usually separated by their somewhat differing habitat preferences. The var. albicans (C. artitecta of Michigan Flora), with staminate scales ± obtuse or broadly acute, the midrib usually weak or absent just below the tip, and culms ± erect and usually surpassing the leaves, occurs in sandy upland hardwoods, sometimes persisting in the open, mostly in southwestern Michigan. 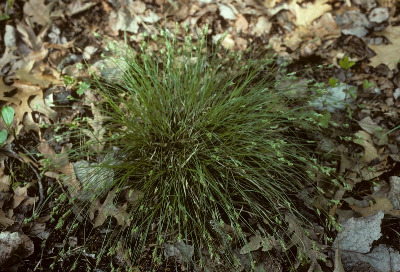 Carex albicans var. emmonsii (Torr.) Rettig (C. emmonsii of Michigan Flora) has staminate scales narrowed to a sharp, often slightly scabrous tip [15×], the midrib prominent to the end or even slightly excurrent, and the culms weak, usually loosely spreading or arching and usually shorter than the leaves. It is more widespread than var. albicans and occurs in moist to dry acidic, sandy or peaty open or shaded ground, often on hummocks in swamp forests, and near wetlands. MICHIGAN FLORA ONLINE. A. A. Reznicek, E. G. Voss, & B. S. Walters. February 2011. University of Michigan. Web. April 21, 2019. https://michiganflora.net/species.aspx?id=898.